Warning: I know this was released in 2007 and therefore I'm probably being over-cautious about this but if you haven't listened to Big Finish and you intended to come to them 'fresh', which I'm hoping I may have persuaded one or two of you to do then the following review contains a SPOILER. So do not read any further. If on the other hand you could not care less then follow me into the next paragraph. 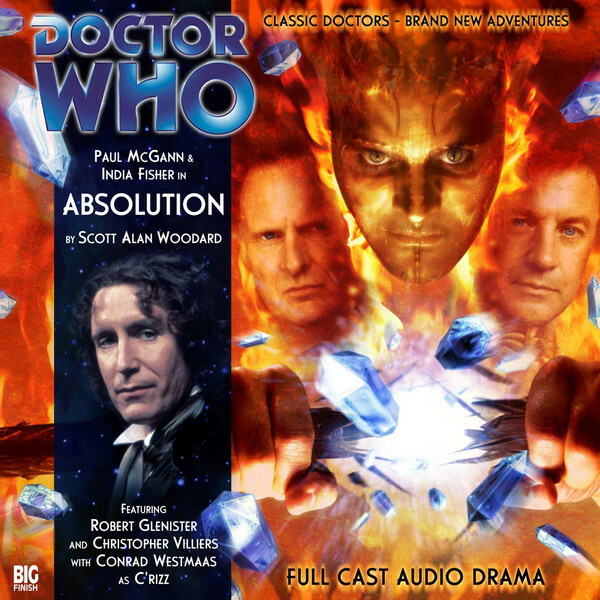 Absolution is an interesting story with an interesting mixture of tones, at least in the first couple of episodes. However it gradually builds up into something dark and tragic. It is also the beginning of the end of an era for the 8th Doctor. We begin with C'rizz dreaming and then Charley and C'rizz talking. Charley is being a little nosey, picks up a piece of C'rizz's religious paraphernalia - a Reliquary - and opens it. C'rizz has been a bit fidgety about opening the box and when Charley does all hell breaks loose. Perhaps literally. The TARDIS is falling apart in a forbidden zone and everything seems to be falling apart. C'rizz is pulled from the TARDIS whilst Charley and the Doctor - after escaping from a rather unpleasant TARDIS breakdown and alarm (of a similarly cryptic nature as in 'The Edge of Destruction' but in this case rather more unpleasant) - land inside 'The Citadel'. The Citadel is run by Cacothis (Christopher Villiers, formally of 'The King's Demons') who has taken up prayer as the only hope for a benighted world. Inside the Citadel all is safe. His daughter Lolanthia (Nathalie Mendoza) is still more scientifically minded and scalds her father for his faith. Outside the genetic wreckage of an scientific catastrophe wander, including Borarus (a demon of sorts and a safe indicator to Cacothis of the impending end of days). Outside the Citadel is hell and the Doctor is welcomed to it. C'rizz is with The Outsiders and has been chosen by Aboresh (Christopher Glenister, formally of 'The Caves of Androzani) to help him take the Citadel. Aboresh works on C'rizz's extra-mental abilities. Teaching him to control minds and move objects. It's a sort of low key version of Luke Skywalker and Yoda but with less swamp and more demons. Aboresh is turning C'rizz into the weapon that Big Finish have been hinting he could be all along: The Absolver. The full story of who and what C'rizz is - or was meant to be - spills out over the four episodes. Aboresh is undoing the Doctor's influence on C'rizz and making him what the Eutermesans intended him to be. By the end the changes are physical as well as mental. C'rizz is the Absolver and he intends to 'save' The Doctor and Charley just as he 'saved' so many others. Aboresh wants revenge on Cacothis and the Citadel and it turns out to be all for the love of a woman, which C'rizz finds rather astonishing. Cacothis had - has - a wife, who Aboresh had an affair with. It all builds up to a wild confrontation, the Doctor's attempt to rig up a solution and a confrontation between Charley, the Doctor and C'rizz. When the Doctor's 'weapon' is set off there seems no way to stop it. But C'rizz absorbs it and has doomed himself to die as a result. C'rizz's death is well-played and rather moving - fortunately not quite moving enough to make me blub in full view of the passengers of the train I was on when listening to this episode. Returning to the TARDIS the Doctor seems almost unmoved by C'rizz's death, which triggers Charley's anger and her desire to leave. Charley's response is one of the more genuine responses to death in Doctor Who. I don't know if the television series could do it like that. Grief makes her angry and the Doctor's almost unbotheredness and the Doctor finds it impossible to articulate how he feels. He only makes it worse. Why he doesn't just say, "Sorry Charley, I'm not human. I might look human but I'm not. I don't feel things the same way as you do." I don't know. But Charley's rage is grief driven. It's quite hard to listen to. You find yourself changing sympathies throughout. Angry at the Doctor's glibness, then at Charley for her unreasonable accusations, then you want to whack the Doctor for saying stupid things. It's a great scene. So C'rizz is dead. Conrad Westmaas does a brilliant job in his final story, especially as he sways between darkness and light at the end. India Fisher is wonderful too. Particularly in the final scenes. The supporting cast are great, although I feel Glenister is a little under-used. Everyone seems to raise their game in the final episode. This isn't the best Big Finish story ever but the final episode with confrontations, deaths and their aftermath is exceptional.